Noel and Blobby outside Cricket House, 1994. Cricket St Thomas is a quiet village in the heart of Somerset, a short distance from Chard and Crewkerne. Its name comes from the de Cricket family, who owned the vast estate in the 12th century. Cricket House, located upon the hillside of the estate, overlooks Tiddlers Lake, which runs through the grounds. In 1967 the estate's owners, the Taylor family, opened the estate to the public. Marketed as Cricket St Thomas Wildlife Park, the rolling countryside was home to all manner of elephants, zebras and cheetahs. A number of shops, cafes and restaurants were added to the park, and a miniature railway was built. By the late 1980s, the park was one of Somerset's most prolific and successful tourist attractions, as well as being a popular visiting spot for locals and residents. However in late 1993, Noel Edmonds' 'House Party' show was one of the biggest TV programmes in the country, and at the time Edmonds was living close to Cricket in Devon. 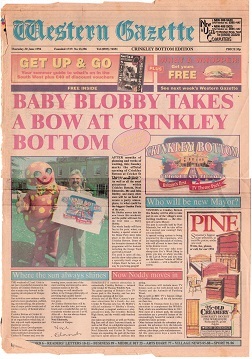 Keen to turn his fictional village of Crinkley Bottom into a reality, a deal was struck with Cricket owner John Taylor in the closing months of 1993 to turn the park into Mr Blobby's home town. Initially the Taylors were enthusiastic about their contract, investing millions into the transformation of Cricket St Thomas into Crinkley Bottom. The wildlife park would remain intact, but numerous attractions would be added. Initially Edmonds was keen to build a replica Great House (as seen in 'House Party'), but it was decided instead to introduce attractions steadily over several years and conclude with the replica Great House later down the line. For reasons that will be made clear, the replica Great House was never built, despite being advertised in the first Crinkley Bottom leaflet as 'coming soon'. Crinkley Bottom opens, July 1994. 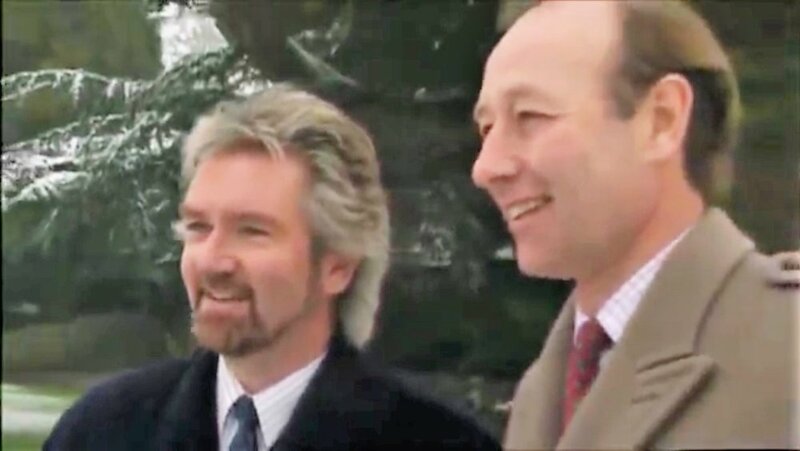 In February 1994, the plans for Crinkley Bottom were unveiled at a press conference, with a smiling Noel Edmonds and John Taylor signing contracts and agreeing on suitable locations for the park's attractions. Work began that spring, with Mr Blobby's House and Noddy in Toytown being among the fist attractions to be made. After months of hard work, Crinkley Bottom at Cricket St Thomas was officially opened by Noel Edmonds on the weekend of 2-3 July 1994. Mr Blobby and his wife were present, and a large Garden Party was held in homage to Noel's House Party. However within weeks of opening, the cracks began to show in Crinkley Bottom's foundations. A joke sign had been added to the official 'Cricket St Thomas' road sign, declaring 'Twinned with Crinkley Bottom', which the Somerset County Council frowned upon and ordered to be removed. Additionally, the quarry that housed Mr Blobby's House and part of Crinkley Bottom High Street had allegedly been built without full planning permission. Eventually the concerns were dropped when it was decided that Mr Blobby's House was adequately hidden from intruding on the landscape, but Crinkley Bottom's problems were far from over. The park had more bad publicity following some questionable treatment to the elephants in the wildlife park, for which Edmonds was blamed yet again. Neighbours complained about the amount of noise that was being generated by attractions and live events, and the English Heritage were concerned that the image of the Grade 1-listed estate was being spoilt by Blobby attractions. However, footfall on the park told a different story, with over 500,000 people visiting Crinkley Bottom in its first season. By the summer of 1995, Crinkley Bottom was so popular that one couple held their wedding at the park, and even had Mr Blobby at their reception. A new attraction, TV's Family Favourites, was launched in July 1995 and was an instant success. Edmonds again pushed to build a replica Great House, but this was officially vetoed by the Somerset County Council in August of the same year. 1995 concluded with its millionth customer entering its gates; two year-old Emmy Turl was greeted by Mr Blobby on arrival to the park in October, and was treated to lunch with the pink star and a years' free entry to the park. By the mid-90s, Mr Blobby's novelty was beginning to fade, and the 1996 season at Crinkley Bottom was not a happy one. With the thirtieth anniversary of the wildlife park just a year away, the Taylors and Edmonds agreed to part ways that September. Due to licensing constraints, Mr Blobby and the other TV-themed attractions remained at the park, although the attraction was rebranded as Cricket St Thomas Wildlife Park once more. Entry prices were reduced, and more emphasis was made on the local community and the park's heritage. During 1997, it was decided that all mention of Mr Blobby should be removed to distance the park from its controversial Crinkley Bottom era. Mr Blobby's House was closed, and signs displaying Blobby-related titles were blacked out with gaffer tape. Noddy and Big Ears became more prominent mascots of the park, and Noddy events were held across the grounds. This continued into the 1998 season, but the financial problems surrounding Crinkley Bottom haunted the Taylor family still. In a desperate bid to escape the shadow of Blobby, Cricket St Thomas estate was put on the market in late 1998 for a cool £8 million. By September, it had been acquired by Warner Holidays, who had a positive track record for turning round the revenue of struggling hotels. After a grand revamp and removal of all things Noddy, Cricket St Thomas became both a hotel and a wildlife park. The final reference to Crinkley Bottom was a message on the park's website declaring 'Please note that the TV Theme Park attractions present in the 1990s no longer exist', which was visible until early 2002. This unusual marriage of hotel and safari continued through the 2000s, but a steady decline in revenue from the wildlife park resulted in its closure in 2009. The grounds were revamped once more to create 'Cricket St Thomas Lakes & Gardens', but this concept was short-lived and scrapped in 2011. Today the estate is accessible only to locals and hoteliers, who may wander the grounds as they wont. Some empty animal enclosures and buildings still stand from the days as a wildlife park, but on the whole Crinkley Bottom is nothing but a memory. So, was Crinkley Bottom at Cricket St Thomas a success? In some ways, it may appear to have been a failure. A rapid decline in attendance figures and numerous complaints regarding the park's image and ethos may suggest it was a terrible idea to begin with. Yet a similar park was opened in Morecambe, and lasted only thirteen weeks due to its incredibly mediocre and underwhelming content. In comparison Crinkley Bottom at Cricket St Thomas was a hit, albeit for a mere two years. But for those 500,000+ visitors between 1994-8, Crinkley Bottom was a magical, blob-tastic slice of childish fun, and not a place we can forget easily. It might not have been Disneyland, but for some of us it was as close as it could get. Since compiling this page, the fantastic YouTube channel Expedition Theme Park has made a brilliant video telling the story of Crinkley Bottom at Cricket St Thomas with a little help from Dunblobbin.com. Not only does it include most of the info from this page, but it features footage, home videos and adverts of the park from back in the day. Don't forget to check out their channel for more awesome theme park videos! If you have any additional information about the history of crinkley bottom you'd like to share, please GET IN TOUCH.